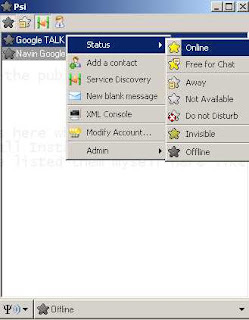 Google Talk - Host of all other IMs like Yahoo,MSN HOTMAIL,IRC etc. HERE's HOW?? The reason of this blog post is " to make Google talk intereact with hotmail users ". 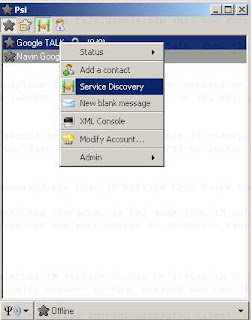 I mean how to enable Google Talk be able to send/receive instant messages across different other IM networks like AOL,YAHOO,MSN. So, if i want to talk to my hotmail ids from my 'Google Talk', here are the steps. (but before that i'll brief the synopsis of this tutorial. -I came to learn Google Talk is built on the Jabber protocol. -We'll be using IM client based on Jabber protocol other than Google Talk. -On that IM client, we'll be using our gmail account settings. It's possible, since Google talk runs on same jabber protocol as i wrote earlier. -from there, we'll connect to other Jabber server, which allows us to connect to our choice of IM networks using Transport service. For the time being,don't bother around what this 'Transport' is. -At the end,it's simple. 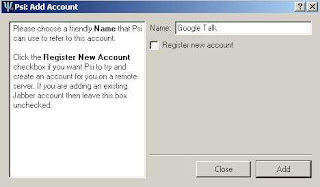 Getting into Google Talk account through other Jabber IM Client,access to Jabber Server,from there use special Transport for different IM networks and then into that IM network. 1) First Download that other Jabber Client. It's called Psi. You can visit and search for the client yourself in http://www.psi-im.org/ or just click http://jaist.dl.sourceforge.net/sourceforge/psi/psi-0.10-win-setup.exe to start downloading the Psi Jabber Client. In the Name field: type 'Google Talk' for example. make sure the Register New Account option is not checked. (we already have gmail account, don't we). When we're done, click Add button in this dialog box. 3)The Account Properties dialog box appears. Select the Account tab, then enter full Gmail address into the Jabber ID field. (don't bother with the password, we've to do it only when asked later). Now, select 'Connection' Tab from the same 'Properties' dialog box, check all the options there and type "talk.google.com" in host field with the default port number "5223" and click Save. In 'Service Discovery'dialog box, enter any of the public Jabber server into the Address field and hit 'Enter' key. 5)Now, after filling the server detail and hitting Enter Key, it'll start showing the available Transports for IM networks in that particular server. (in my case, i wanted to use hotmail id, so i'd be using Hotmail Transport). Lets wait for a minute. Now, from available Tranports, select choice of transport. In my case, it's to deal with Hotmail. So, i'll right-click 'MSN Transport' and select 'Register'. Now, have to give my hotmail address and password and click Register. 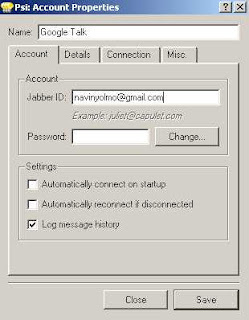 It will start fetching all the contacts from the my hotmail account to Google Talk account. 6)Once, all contacts are fetched from the selected IM network, now it's time to deal with the contacts to add to 'Google Talk' account. Right-Click on every hotmail ID fetched and click the Add/Auth button to authorize each contact. Then, once all contacts have been retrieved, exit Psi. 7)Next time, when we run 'Google Talk', there will be lots of contacts waiting to be invited on our Google Talk list. Accept them all and now there are all friends with hotmail ID within Google Talk. 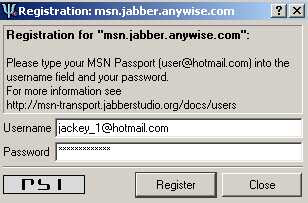 No more fuss to sign in to Msn Messenger or any other IM client so far. 8) So,it's Google talk using Jabber Server which gives us 'Hotmail transport' allowing us to add Hotmail users in 'Google Talk' list and so the life goes. Indeed, we took a help of Psi, a jabber client for all this to happen. well best solution would be using a third party im clients. I myself use GAIM and it is really good software. It is a free ware and i guess it could easily downloaded with the help of some googeling. I use windows live messenger. Aru messenger chalauna manley nai mandaina.